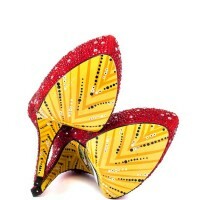 Christian Louboutin might have conquered the red soles, but Taylor Reeve is taking them to heavenly heights…or maybe the other place depending on the design. This “crazy blondie from Southern California”, as she describes herself, started out painting her designs on unconventional objects, like motorcycles and surfboards, but moved on to work for places like Quicksilver, Bell Helmets, Dragon Alliance, and Skullcandy. 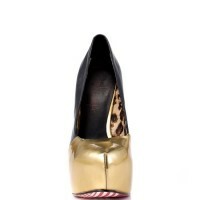 Now she’s taking her skills to style the sole…of our shoes that is. 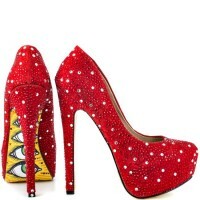 After being introduced to her website, I found myself falling deeply in lust with her primo pumps. 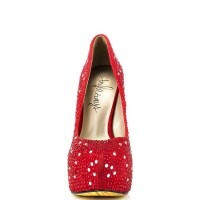 I can’t wait to get my tootsies into the Royal Hearts pumps, or the Skeleton Elvis, VegVis with a gold toe, and who can resist having eyes on the soles of your shoes like the sparkly, ruby red Lookie! How will you choose? 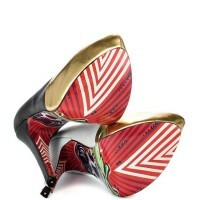 TAYLORSAYS- an unprecedented line of high heel shoes featuring custom designed leather printed soles. 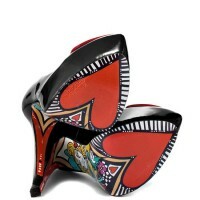 Express yourself with these fearless pumps that are sure to stand out and get noticed!